How did we come to this astonishing conclusion? The story begins in the mid-1900s when astronomers expanded their horizons beyond the very narrow range of wavelengths to which our eyes are sensitive. Very strong sources of radio waves were discovered and, when accurate positions were determined, many were found to be centered on distant galaxies. Shortly thereafter, radio antennas were linked together to greatly improve angular resolution. These new “interferometers” revealed a totally unexpected picture of the radio emission from galaxies—the radio waves did not appear to come from the galaxy itself, but from two huge “lobes” symmetrically placed about the galaxy. Figure One shows an example of such a “radio galaxy,” named Cygnus A. Radio lobes can be among the largest structures in the universe, upward of a hundred times the size of the galaxy itself. How are immense radio lobes energized? Their symmetrical placement about a galaxy clearly suggested a close relationship. In the 1960s, sensitive radio interferometers confirmed the circumstantial case for a relationship by discovering faint trails, or “jets,” tracing radio emission from the lobes back to a very compact source at the precise center of the galaxy. These findings motivated radio astronomers to increase the sizes of their interferometers in order to better resolve these emissions. FIGURE ONE: Radio image of the galaxy Cygnus A. Dominating the image are two huge “lobes” of radio emitting plasma. An optical image of the host galaxy would be smaller than the gap between the lobes. The minimum energy needed to power some radio lobes can be equivalent to the total conversion of 10 million stars to energy! Note the thin trails of radio emission that connect the lobes with the bright spot at the center, where all of the energy originates. When astronomers calculated the energy needed to power radio lobes they were astounded. It required 10 million stars to be “vaporized,” totally converting their mass to energy using Einstein’s famous equation E = mc2! Nuclear reactions, which power stars, cannot even convert 1 percent of a star’s mass to energy. So trying to explain the energy in radio lobes with nuclear power would require more than 1 billion stars, and these stars would have to live within the “microscopic” volume indicated by the VLBI observations. Because of these findings, astronomers began considering alternative energy sources: supermassive black holes. Given that the centers of galaxies might harbor supermassive black holes, it was natural to check the center of our Milky Way galaxy for such a monster. In 1974, a very compact radio source, smaller than 1 second of arc (1/3600 of a degree) was discovered there. The compact source was named Sagittarius A*, or Sgr A* for short, and is shown at the center of the right panel of Figure 2. Early VLBI observations established that Sgr A* was far more compact than the size of our solar system. However, no obvious optical, infrared, or even X-ray emitting source could be confidently identified with it, and its nature remained mysterious. Meanwhile, the development of high-resolution infrared cameras revealed a dense cluster of stars at the center of the Milky Way. These stars cannot be seen at optical wavelengths, because visible light is totally absorbed by intervening dust. However, at infrared wavelengths 10 percent of their starlight makes its way to our telescopes, and astronomers have been measuring the positions of these stars for more than two decades. These observations culminated with the important discovery that stars are moving along elliptical paths, which are a unique characteristic of gravitational orbits. One of these stars has now been traced over a complete orbit, as shown in the left panel of Figure Two. FIGURE TWO: Images of the central region of the Milky Way. The left panel shows an infrared image. The orbital track of star S2 is overlaid, magnified by a factor of 100. The orbit has period of 16 years, requires an unseen mass of 4 million times that of the sun, and the gravitational center is indicated by the arrow. The right panel shows a radio image. The point-like radio source Sgr A* (just below the middle of the image) is precisely at the gravitational center of the orbiting stars. Sgr A* is intrinsically motionless at the galactic center and, therefore, must be extremely massive. Many stars have been followed along partial orbits, and all are consistent with orbits about a single object. Two stars have been observed to approach the center to within the size of our solar system, which by galaxy standards is very small. At this point, gravity is so strong that stars are orbiting at nearly 10,000 kilometers per second—fast enough to cross the Earth in one second! These measurements leave no doubt that the stars are responding to an unseen mass of 4 million times that of the sun. Combining this mass with the (astronomically) small volume indicated by the stellar orbits implies an extraordinarily high density. At this density it is hard to imagine how any type of matter would not collapse to form a black hole. The infrared results just described are beautifully complemented by observations at radio wavelengths. In order to identify an infrared counterpart for Sgr A*, the position of the radio source needed to be precisely transferred to infrared images. An ingenious method to do this uses sources visible at both radio and infrared wavelengths to tie the reference frames together. Ideal sources are giant red stars, which are bright in the infrared and have strong emission at radio wavelengths from molecules surrounding them. By matching the positions of these stars at the two wavebands, the radio position of Sgr A* can be transferred to infrared images with an accuracy of 0.001 seconds of arc. This technique placed Sgr A* precisely at the position of the gravitational center of the orbiting stars. How much of the dark mass within the stellar orbits can be directly associated with the radio source Sgr A*? Were Sgr A* a star, it would be moving at over 10,000 kilometers per second in the strong gravitational field as other stars are observed to do. Only if Sgr A* is extremely massive would it move slowly. The position of Sgr A* has been monitored with VLBI techniques for over two decades, revealing that it is essentially stationary at the dynamical center of the Milky Way. Specifically, the component of Sgr A*’s intrinsic motion perpendicular to the plane of the Milky Way is less than one kilometer per second. By comparison, this is 30 times slower than the Earth orbits the sun. The discovery that Sgr A* is essentially stationary and anchors the galactic center requires that Sgr A*contains over 400,000 times the mass of the sun. Recent VLBI observations have shown that the size of the radio emission of Sgr A* is less than that contained within the orbit of Mercury. Combining this volume available to Sgr A* with the lower limit to its mass yields a staggeringly high density. This density is within a factor of less than 10 of the ultimate limit for a black hole. At such an extreme density, the evidence is overwhelming that Sgr A*is a supermassive black hole. These discoveries are elegant for their directness and simplicity. Orbits of stars provide an absolutely clear and unequivocal proof of a great unseen mass concentration. Finding that the compact radio source Sgr A* is at the precise location of the unseen mass and is motionless provides even more compelling evidence for a supermassive black hole. 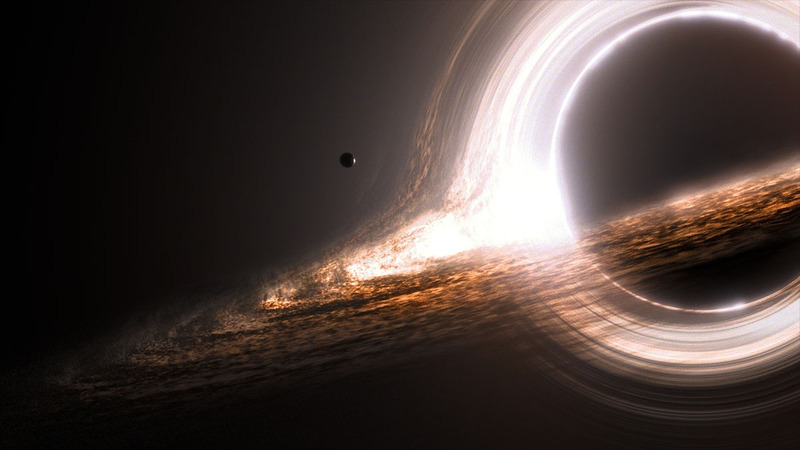 Together they form a simple, unique demonstration that the fantastic concept of a supermassive black hole is indeed a reality. John Michell and Pierre-Simon Laplace would be astounded to learn that their conjectures about black holes not only turned out to be correct, but were far grander than they ever could have imagined.